BC Williams, Writer/Poet :: ALL WORKS :: Kids . . . :: KIDS are to be seen and HEARD from! AT FIFTH AND BROAD ON WEEK DAYS. McFEENY SELLS THEM YOUR WAY. Do ya want a dog with mustard Mister, like the one I sold your lovely sister? Would you rather try one all the way with pop and chips? Yes, you say? and chili, with chopped onions and relish. Whatever you want for embellishment. smothered in sweet kraut and caraway seeds and Mister ate it up indiscreetly. You come back tomorrow Mister for my other famous dog, the Big Galore. He's one hundred percent pure beef so tasty folks shake their head in disbelief. FOLKS, GET YOUR DOGS HOT OFF THE GRILL. IT'S ENOUGH TO MAKE YOUR HUNGRY HEART THRILL! 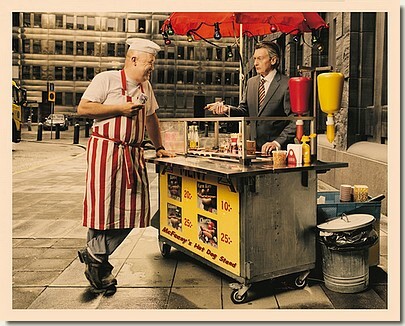 AND REMEMBER, IT'S WHATEVER YOU SAY, CUZ I SELL HOTDOGS YOUR WAY. Or perhaps another category of poems?